North Korean leader Kim Jong-un has departed by train for Hanoi to hold a second summit with U.S. President Donald Trump later this week, Pyongyang’s state media reported Sunday. 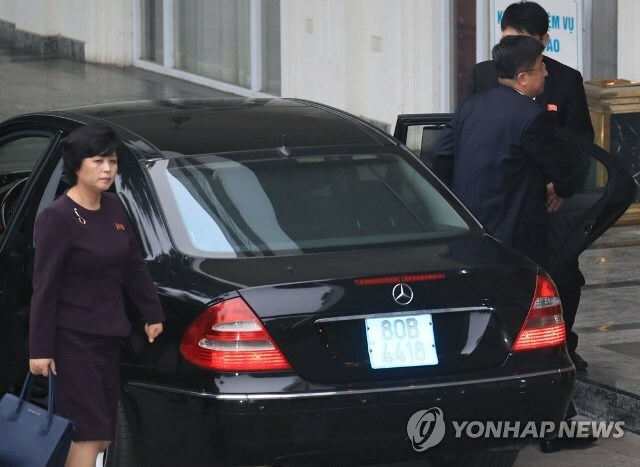 Kim left Pyongyang Railway Station on Saturday afternoon and was accompanied by senior officials, including his sister Kim Yo-jong and top aide Kim Yong-chol, the Korean Central News Agency reported. “Senior officials of the Party, government and armed forces organs sincerely wished Kim Jong-un good success in the second DPRK-U.S. summit meeting and talks and safe return,” the KCNA said, using the initialism for the North’s official name, the Democratic People’s Republic of Korea. But there was no mention of Kim’s wife, Ri Sol-ju, in the list of those accompanying the leader. Kim is to hold his second summit with Trump from Feb. 27-28. The KCNA also reported that Kim will make an official goodwill visit to Vietnam at the invitation of Vietnamese President Nguyen Phu Trong. It was the first time that North Korean state media have reported on Kim’s second summit with Trump. The North’s state TV aired footage of Kim’s departure. 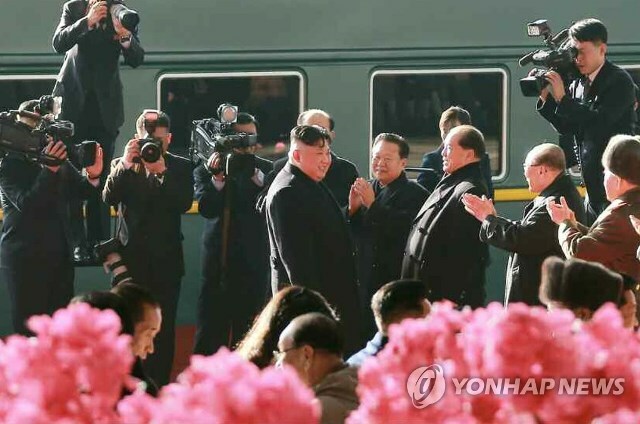 The Rodong Sinmun, the official newspaper of the North’s ruling party, devoted its front page to relevant coverage and pictures that showed top officials and others lining up at the station’s platform to see him off. North Korea’s media had been mum on Kim’s trip to Vietnam for weeks despite Washington’s announcement on the date and location of the summit. Pyongyang is usually secretive about its leader’s overseas trips for security reasons. Sunday’s reporting came after Russia’s Tass news agency earlier reported from Pyongyang that Kim’s train departed for Hanoi at around 5 p.m. Saturday. Sources later said his train crossed into the Chinese border town of Dandong around 9:40 p.m. The train is widely expected to travel a total of around 4,500 kilometers for about 60 hours and arrive in the Vietnamese border city of Dong Dang in Lang Song province on Tuesday. From there, Kim is expected to travel to Hanoi by car. Vietnamese media outlets earlier reported that all traffic will be banned from a section of a highway linking the border city to Hanoi between 6 a.m. and 2 p.m. on Tuesday, but all of the reports have later been removed apparently at the instruction of authorities. Before his departure, speculation had been swirling about what transportation Kim will use. Flying on a state jet, code-named Chammae-1, was originally considered the most likely option, but the possibility of a train trip gained significant traction after a senior North Korean official preparing in Hanoi for the leader’s trip visited a train station near the border with China. Kim used a rented Chinese plane to travel to Singapore for his first summit with Trump last June. He arrived at the summit venue two days ahead of the historic meeting. When Kim’s grandfather and the North’s founding leader, Kim Il-sung, visited Vietnam in 1958 and 1964, he traveled by train to Beijing, where he flew on a rented plane to Hanoi via the southern Chinese city of Guangzhou, North Korea experts said. 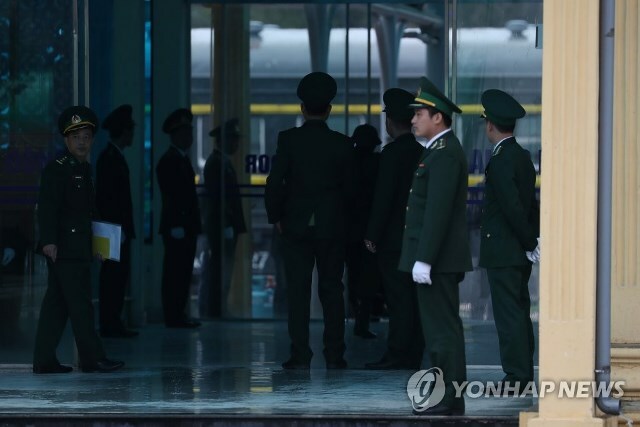 In Hanoi on Sunday, an Air Koryo cargo jet carrying North Korean security officials and vehicles arrived at the capital’s main Noi Bai International Airport around 9:20 a.m., according to local media reports. Dark-suited security guards were seen walking on the tarmac after disembarking from the plane, the reports said. About an hour later, two black SUVs without license plates left the airport’s VIP building, led by police cars. The vehicles were believed to be brought in for security operations for the North’s leader. 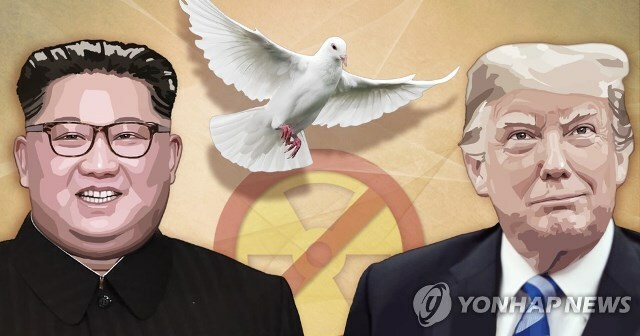 In their June summit, Kim and Trump agreed to complete denuclearization of the Korean Peninsula in exchange for security guarantees from the U.S. This week, they are expected to focus on concrete denuclearization steps by the North and “corresponding” measures by Washington, possibly including easing sanctions and improving bilateral relations.